Interactive visualization is emerging as a vibrant new form of communication, providing compelling presentations that allow viewers to interact directly with information in order to construct their own understandings of it. Building on a long tradition of print-based information visualization, interactive visualization utilizes the technological capabilities of computers, the Internet, and computer graphics to marshal multifaceted information in the service of making a point visually. This book offers an introduction to the field, presenting a framework for exploring historical, theoretical, and practical issues. It is not a “how-to” book tied to specific and soon-to-be-outdated software tools, but a guide to the concepts that are central to building interactive visualization projects whatever their ultimate form. The framework the book presents (known as the ASSERT model, developed by the author), allows the reader to explore the process of interactive visualization in terms of choosing good questions to ask; finding appropriate data for answering them; structuring that information; exploring and analyzing the data; representing the data visually; and telling a story using the data. 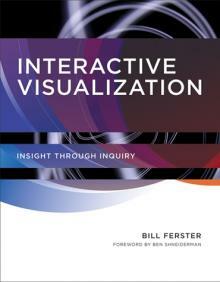 Interactive visualization draws on many disciplines to inform the final representation, and the book reflects this, covering basic principles of inquiry, data structuring, information design, statistics, cognitive theory, usability, working with spreadsheets, the Internet, and storytelling. Bill Ferster is on the faculty of the University of Virginia with a joint appointment to the Center for Technology and Teacher Education at the Curry School of Education and at the Science, Humanities, and Arts Network of Technological Initiatives (SHANTI) at the College of Arts and Sciences. “Ferster’s book “stands out from the crowd” because it is based on what I would call a “holistic approach” to information visualization, namely his ASSET model described above. It starts by asking questions and culminates in “telling a compelling story” with the visual representation created from the data.